Helen Garner is thirteen years older than I am, and I feel as if I have been walking in her footsteps all my life. Not following her lifestyle, mind you, but watching her with curiosity, as a life that I might have led had I been a little older and more confident. I felt as if I knew Dexter and Athena in The Children’s Bach– in fact, I’m sure I know where their house is! When I was an undergraduate, still living at home with Mum and Dad, I’m sure that my fellow students were living a far more exciting Monkey Grip life than I was. Like Garner, I felt troubled by the challenge to feminism in The First Stone, and repelled and yet fascinated by Anu Singh in Joe Cinque’s Consolation. Now that I’m growing older and facing the deaths of parents and friends, I see myself in The Spare Room. 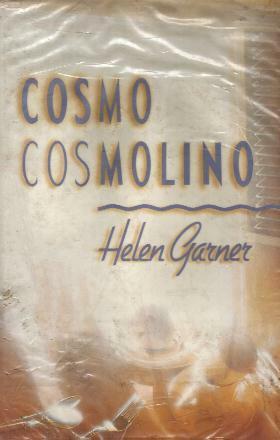 But with Cosmo Cosmolino, published in 1992 when Garner was fifty, my sense of identification breaks down. The book contains three stories, tangentially linked. Cosmo Cosmolino is the longest of the three, and although they are different characters, the lifestyle of its protagonists almost picks up, twenty years on from where the lifestyles of the people of Monkey Grip left off. The anarchic share-houses of the 70s are now just shells, containing wary, embittered middle-aged people, somewhat discomfited by the capitalist mores they found themselves adopting almost in spite of themselves, and younger drifters in a world of marginal working lives that is less tolerant of the artistic temperament than the 70s were. These are people whose family relationships are just single strings rather than a densely woven fabric; there is a bleak loneliness about their situation and their outlook. They are trying to find some meaning in their days, either through trying to recreate an idealized past of share-houses now gone, or through a fervid evangelical Christianity or a loopy new-age spirituality. I’m not sure if my discomfort with this mushy angel-think is a reflection of my own cynicism, or whether it is because the book is nearly twenty years old. Perhaps in the early 1990s, belief in angels was not so twee and flaky- after all, didn’t they market those bumper stickers “Magic Happens” back then? When were healing crystals and all that other dusty paraphernalia around? There’s something pathetic about this book, and I suspect that it was not intended to be so. I think that Garner is genuinely working through issues of spirituality and meaning. It’s just not a quest that I find particularly compelling. This entry was posted in Australian Women's Writing, Book reviews. Bookmark the permalink. Yep, back in the early 90s the crystals were cheap, the messages and intent were as real as the original ideal of the 70s yet it followed the same pattern…the prices were jacked up and fakes flooded everywhere as it was seen as just another area to print money. That’s an interesting idea, that the 70s and 90s were linked- almost as a cycle. I’m attracted to the idea of generational cycles- that Strauss and Howe idea of “turnings” in the generations (although it doesn’t quite fit into the 20 year gap here). I don’t like the stereotyping and marketing that goes along with it, but I do think that there are certain mentalities that are picked up on in a cyclical manner.